just thought some of you might want to know if you dont watch the news much. not sure what i think about this yet, it would have been best if we captured him but thats not always possible. not looking forward to the retaliate of Al Queada. not sure how much of this i believe until i see photos and dna evidence. 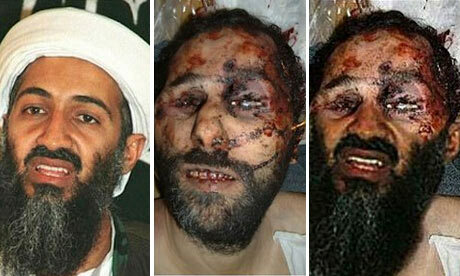 Photo of Osama Bin Laden before and after he was shot. These photo are in the newspaper and its apparantly him. But I still not sure if it really is him or not. Yup I also think the photo are fake. But I not sure if he dead or not. no question that photos are fake. u can see the same textures, bits of background and bruising/bloodstains repeated in both pictures. but its definitely him who was killed today. why else would his family and courier be there? De foto van een verminkte man, zogezegd Osama bin Laden, die maandag verspreid werd door Pakistaanse televisiezenders en overal ter wereld overgenomen werd, is vals. Dat hebben de Pakistaanse media toegegeven. De foto werd 'uit de lucht' gehaald. Meerdere zenders hadden de foto verspreid, maar maakten tegelijkertijd duidelijk dat ze niet konden garanderen dat de persoon op de foto met zekerheid de gedode leider van al-Qaida was. 'Het ging inderdaad om een valse foto, die in 2009 al op internet circuleerde', bevestigde Rana Jawad van Geo TV, de populairste televisiezender van Pakistan. 'Toen we de foto verspreid hebben, hebben we gezegd dat we niet zeker waren van de authenticiteit van het beeld. Vervolgens hebben we de foto nagetrokken en, omdat het om een vals beeld bleek te gaan, van het scherm gehaald', besloot hij. Ook alle andere kanalen haalden de foto van hun scherm. De foto toonde het bebloede en gedeeltelijk verminkte gezicht van een man met een ruige zwarte baard. Het Franse persagentschap AFP kon aan de hand van een softwareprogramma ook al aantonen dat de foto getrukeerd was. Daarvoor werd de baard en het onderste gedeelte van Bin Ladens gezicht van een oudere foto overgenomen. 'De baard is vaag. Je ziet duidelijk dat het om een montage gaat', aldus Mladen Antonov, de chef van de fotoredactie van AFP. Het persagentschap heeft de foto intussen als vals aangeboden en de trucage uitgelegd. Tot op dit moment is er nog geen enkele foto van de dode Bin Laden gepubliceerd. The picture of a mutilated man, allegedly Osama bin Laden, which was distributed Monday by Pakistani television channels worldwide and was acquired, is fake. That the Pakistani media have admitted. The picture was "off the air 'met. Several stations had the photo spread, but simultaneously made clear that they could not guarantee that the person in the picture with certainty the slain leader of al-Qaeda was. "It was indeed a false picture, which in 2009 already circulated on the Internet," confirmed Rana Jawad of Geo TV, Pakistan's most popular television channel. "When we have the photo spread, we said that we were not sure of the authenticity of the image. Then we checked the photo and, because it turned out to be a false image of the screen removed, "he concluded. All other channels took the picture of their screen. The picture showed the bloodied and partially mutilated face of a man with a shaggy black beard. The French news agency AFP was using a software program even prove that the photo was manipulated. Therefore, the beard and the lower part of bin Laden's vision of an old photograph taken. "The beard is vague. You can clearly see that it is an assembly, "said Mladen Antonov, the head of the photo editors of AFP. The news agency has the picture now presented as false and tricks explained. Up to this moment there is no photo of the dead bin Laden published. DNA tests are done confirming it is him. he actually used a woman at the compound as a human shield who died as they shot him. he used the one courier for so long because it was just one guy in the whole of pakistan so would have thought theyd find him, remember it has been 10 years since we started searching. lol i was about to say that bit about no countries accepting his body so he can buried with 24hrs (muslim tradition i think). what did you mean about the courier? craft, the reason he used the same courier for so long is because he trusted him more than anyone else. also, the idea of living close to the enemy is quite clever in a way because its like reverse psychology and the pakistani army would never think of finding him so close to their own base. Plus pakistan is one of the most courupt countries in the world when it comes to terrorism, I bet some people got paid allot of money to turn a blind eye on what that building was being used for. If the cunts dead Yaba Daba Doo! They may retaliate but at least their inspiration has been killed! Hes still alive untill is ee the raw footage of him getting 2 slugs in the bake. yeah there is gunna be loads on conspiracy about whether he is dead or alive, i dont think hes dead personally as i wouldnt trust the americans word for it. It's so strange how Osama was the son of a multi-millionaire oil baron but chose to join the mujahadeen (not sure on spelling) then a terrorist group to fight the very country who helped his country defeat the Russian invasion.